Warlords of Draenor brought to the table a lot of new story that all roleplayers can use and play with, but it also brought a pretty unique opportunity for both draenei and orc roleplayers. Because this expansion is taking place in an alternate universe version of Draenor, orc and draenei roleplayers now have the chance to play in a world of “what-if.” What if your character is not from Azeroth, but in fact originated on this version of Draenor? What if you have two versions of the character you’ve been playing all along — the Azeroth version, and the Draenor version? What if the two of them meet? It’s a fascinating proposition, one that’s both creatively interesting, and potentially problematic. While some roleplayers have dismissed the idea of this strange form of double-play, there are plenty of others that have stepped up to the challenge and fleshed out either brand new, original characters, or an entire secondary history regarding that curious question of what if. While we do subscribe wholeheartedly to the idea that you can roleplay whatever you want, there’s nothing wrong with having some established lore to look at for references sake, so let’s take a quick peek at just what these AU-races are up to. Of the two playable races found on Draenor, I think the draenei are probably the more emotional to play, and for good reason. Draenei from Azeroth are the survivors of the most horrific slaughter their race had ever experienced — they are tough, they are resilient, and they are touched by sorrow. But a draenei from this version of Draenor is currently in the middle of living through all of that. Certainly the orcs didn’t consume the blood of demons, but they are still pretty focused on slaughtering and conquering draenei settlements. 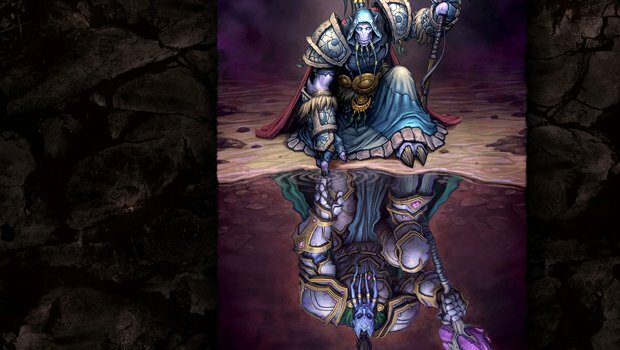 In Shadowmoon Valley, Ner’zhul was even planning on harnessing the power of a darkened and dying naaru, a creature that the draenei hold great respect, esteem, and maybe even reverence for, due to the race’s involvement in allowing the draenei to flee from Argus in the first place. Karabor, bastion of the Light comes under attack, as does Shattrath. And perhaps most heartbreaking of all are the Sargerei — draenei who have chosen, after thousands of years of flight and escape, to turn and join the Burning Legion after all. It’s a lot for one draenei to take in and live with. 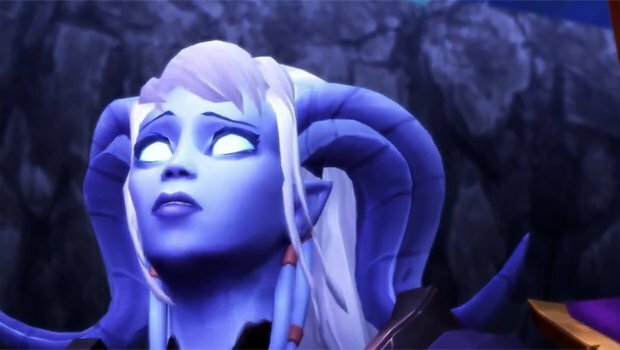 Throw in the sudden appearance of a lot of alien races alongside draenei that have never been seen before, and any normal draenei now has a story that is impossibly hard to swallow — proof that there are other worlds, and proof that those other worlds include more draenei survivors, ones who suffered deeply. Shaman don’t exist. Rather, they do exist, but they are exclusively orcs. Shamanism wasn’t learned by the draenei until after the orcs drank the blood of Mannoroth, pillaged Shattrath, and sparked the beginnings of the Broken. Nobundo was the first of these shaman, and obviously he is alive, well, and healthy on this version of Draenor. But the reason that the elements chose to speak to Nobundo is that the Light had left him, forsaken him, just as the orcs had forsaken the elements — there was a common ground there, and a wisdom in Nobundo that the elements recognized and respected. In this timeline, the orcs have not forsaken the elements, and most of them have not turned to the Burning Legion. This isn’t to say that you can’t play an AU draenei shaman — you’re certainly welcome to do so. But an AU draenei who has decided to follow a path that only orcs have followed isn’t exactly going to be well received or understood. You know something is up. There’s no way your character couldn’t know somethings strange was going on, in regards to the appearance of strangers. Alien races are all well and good, and understood. But more draenei? From a distant world? That’s downright fishy, and it’s because the only draenei survivors of Argus are the ones on Draenor right now. The ones that went with Velen, the ones who hopped from planet to planet and eventually settled on Draenor, your home. These strange draenei, whoever they are, are a curious and disquieting mystery of sorts — one that your character may or may not choose to explore. Corruption is a distinct possibility. You want to play a villain? Easily done, with the appearance of the Sargerei. Simply have your character choose the Legion’s path. If you’re roleplaying an AU draenei, that character doesn’t automatically have to be some kind of hero. Societal rifts exist. 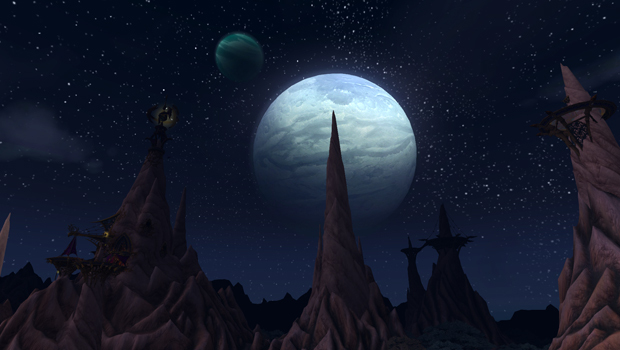 There’s a tension that exists among the draenei, and two schools of thought have been shown in Shadowmoon Valley — those who wish to claim and tame Draenor, turning it into another Argus, and those who wish to explore and preserve Draenor, living on the planet and appreciating it for what it is. From what we’ve been shown, the Rangari are the most adamant about learning and existing on the world without trying to terraform it into some replication of Argus. The others are more interested in recreating the wonders of Argus, regardless of the effect that might have on Draenor. You don’t have to play to one side or the other, but the dynamic is there if you want to delve into it. For orc roleplayers, the challenge of playing an AU orc takes a little bit of suspension of disbelief right off the bat, for one reason — all player-created orcs have green skin. Native Draenor orcs do not. Fortunately, roleplaying addons like Total RP, MyRoleplay, or XRP allow you to create and fill in a profile for other players to read, and you can define your appearance there. And don’t get me wrong, there’s plenty of emotion to be had from playing a Draenor orc as well, depending on which side you’re trying to play. If you’re going to play as a member of the Iron Horde, you’re going to be considered a villain. 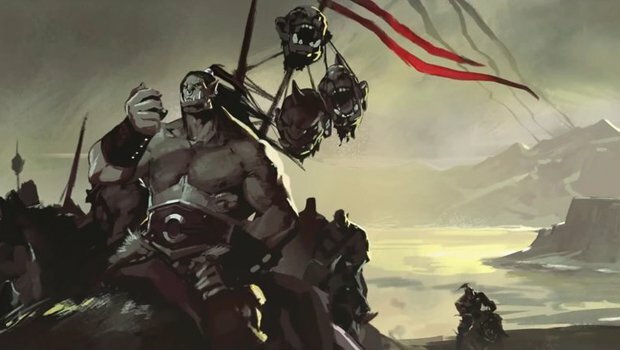 But if you choose to play an orc that has turned from the Iron Horde, particularly an orc from one of the clans who are currently following Grommash Hellscream, your character is going to have to deal with the fact that they have essentially alienated their clan, and vice versa — a pretty heavy subject. If you choose to play as a Frostwolf, you’re dealing with the fact that your chieftain pretty much dismissed the idea of joining the Iron Horde outright, and your character can either agree with that decision, or live with the frustration of your chieftain’s choice. And those green-skinned strangers that suddenly appeared out of nowhere? Yeah, your character is probably going to be more than a little wary of those guys, particularly since the only other green-skinned orcs you’ve seen are those that were Legion-aligned. Grommash Hellscream stopped the orcs from drinking Mannoroth’s blood, proclaimed that they would never be slaves — and here is an apparent army of orcs who apparently didn’t know or didn’t care about that warning and chugged the Legion’s Kool-Aid without thinking about it. That may frighten your character, it might fascinate them, it might make them angry — that’s up to you to decide. Warlocks are not good. The only real encounter your orc has had with demons has been through the efforts of the Burning Legion. Therefore, someone who commands demons must theoretically be from the Burning Legion, involved with it somehow, or possibly working with Gul’dan. And nobody likes Gul’dan. If you’re roleplaying an orc warlock from this AU universe, they’re either sided with Gul’dan, the Legion, or they’ve turned away from them both — but there’s one thing that character isn’t likely to be: Trusted. Not in the slightest. Your clan matters. Currently, the Warsong, Blackrock, Bleeding Hollow, Shattered Hand, Thunderlord, and Burning Blade clans are all actively involved and in support of the Iron Horde on Draenor. If your character originates from one of these clans, they are likely either in support of the Iron Horde, or they’ve deserted their clan. It’s easy enough to play a villain this expansion if you want to take on the idea of being a member of the Iron Horde, but it’s also pretty interesting to deal with the fallout from losing your clan, and how the Frostwolves and the outsiders from another world react to your character due to their origins. Your world is not one of sweetness and light. Orcs aren’t friendly, happy go lucky dudes, not even when they haven’t been corrupted by the Burning Legion. For an excellent idea of how the orcs act, not to mention some pretty good history into the formation of the various clans, I highly recommend taking a look at the series Lords of War on Youtube. You get a really good idea of how orcish society works. You don’t know about Garrosh. If you’re from the Warsong Clan, obviously you know about Garrosh Hellscream, as he’s currently acting as leader out there … at least until you finish Nagrand. But as far as we know, Garrosh never told anyone where he was really from, nor did he disclose who his father really was. In various letters and journals found around Draenor, there’s an indication that Garrosh is known as a Prophet — but he’s never referred to as Hellscream’s son. There’s another, slightly more difficult and interesting direction that orc and draenei roleplayers can take with this expansion: The possibility of dual selves. On the one hand, you have the Azeroth character you’ve been playing all along, on the other, you have their Draenor double. Blizzard has gone out of their way to make sure this strange scenario doesn’t exist or come up with this expansion, but that doesn’t mean you can’t explore it if you’d like. In this scenario, the Draenor version of your character has the possibility of being just about anything you’d like them to be. Maybe your Azeroth character is a shaman, but on this Draenor, they’re a Rangari, or even a Vindicator. Maybe friends or family that your Azeroth character lost still exist on this version of Draenor — an interesting prospect to play with, because your character suddenly has to come to terms with the fact that loved ones they thought long dead are suddenly alive and kicking. How do they react? What do they do? For the orcs, it’s even more interesting, because you have the possibility of a brown-skinned Draenor native who clearly turned away from the choice of taking power from the Burning Legion, suddenly confronted with a green-skinned version of themselves. A living, breathing reminder of what could have been, staring them right in the face. And once again, you have the prospect of running into loved ones you once thought long-gone — only with that green skin, you might not get as friendly a reception as you could’ve hoped for. Do you tell them who you are? Do you tell them where you’re from? For both, there’s the chilling prospect that your Draenor double has turned to the dark side, joining either the Iron Horde, or the Sargerei. How does your Azeroth character react to the news that in another time, another universe, another life, they fell to the darkness they have spent their lives fighting against? How does that make them feel? Do they begin to question their own choices and motives? Do they wonder if the potential for darkness lies within them still? It’s an interesting internal conversation, one that could have long-lasting impact on your Azeroth character. Warlords of Draenor has opened wide the door for creative freedom, casting aside rigid timelines and structure for the idea that yes, there is more than one universe out there, yes, time travel is possible and plausible and yes, there is the potential for multiple versions of ourselves. How you choose to utilize that potential is entirely up to you.